World Reborn © 2015 Piko Interactive LLC. World Reborn is not like your normal shooter game, as it is also a game with role playing game elements as well. In World Reborn we are introduced to a world where mankind has lost all records of its history, discoveries, and their achievements In this horizontal shooter you will choose your stage and attack back at the enemy. Collect XP from kills and from pick-ups in the stages and rank both yourself and your ship up to increase your combat abilities. 6 powerful pickups that will enhance or change your weapon, give secondary fire, boost your speed and more will be at your disposal. All your progress in this game will be safe through the use of an intricate password save. 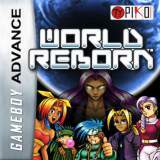 World Reborn was a GBA project that was developed but not released back in the early 2000's.